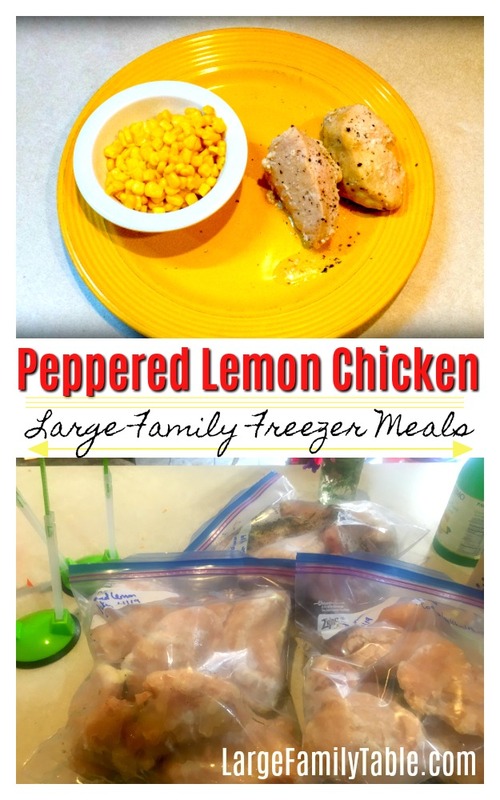 On my recent large family freezer cooking today I made three one gallon bags full of Peppered Lemon Chicken. I like having different chicken options available for quick and easy dinners. I cooked up this Peppered Lemon Chicken in the slow cooker the other day. The kids were thrilled we also had a big can corn in the pantry. They had buttered corn, the Peppered Lemon Chicken, and apple slices with their dinner. You can dress up this dish any way you’d like. Serve it as a main protein at dinner time. Have it cold on top of garden salads. Use leftover Peppered Lemon Chicken as a base for homemade chicken salad. There are lots of ways you can use this vertile chicken dish! Dress up this Peppered Lemon Chicken dish any way you’d like. You can serve it as the main protein at dinner time. Have it cold on top of garden salads. Use leftover Peppered Lemon Chicken as a base for a homemade chicken salad. There are lots of ways you can use this versatile chicken dish! 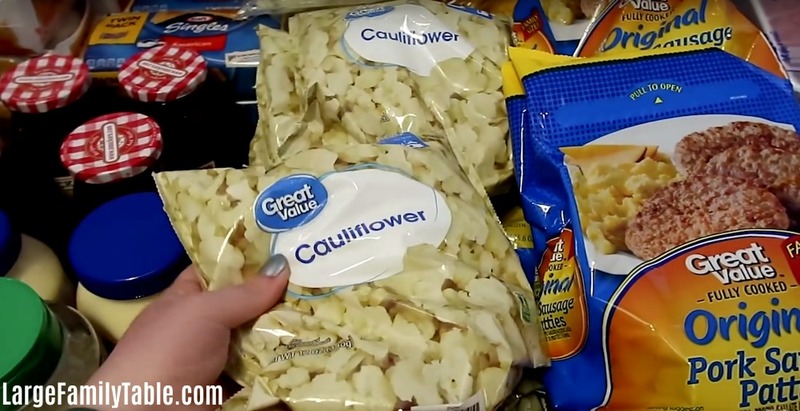 Divide ingredients evenly amongst three labeled one-gallon freezer bags. Freeze up to 3-months. When you desire to serve this recipe just thaw the bag in the refrigerator the night before. On cooking day dump contents of the bag in the Instant Pot or Slow cooker. For Instant Pot cook soup on manual high for 30 minutes. For the Slow Cooker on high up to 4 hours, low 6-7 hours. Serve with your favorite side dishes. Welcome back to my large family meal plans post where I share with you what I plan to feed my large family in the coming 4+ weeks. 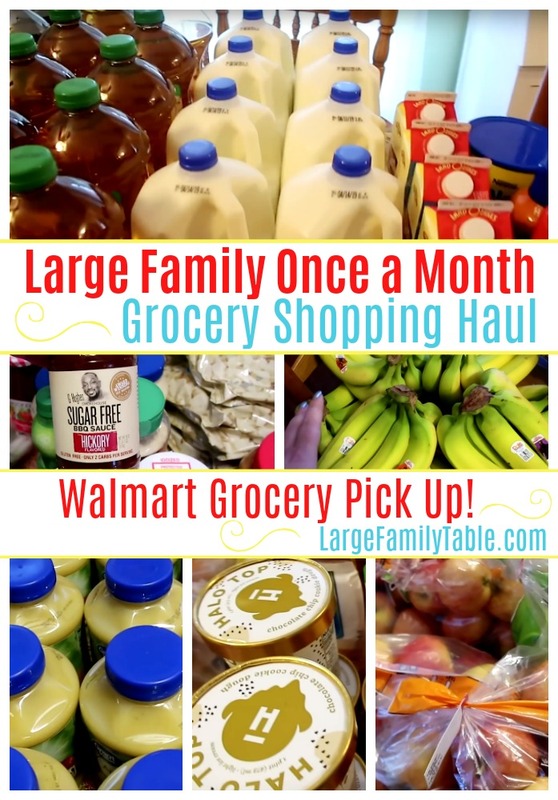 I recently shared my large family once a month grocery shopping haul from Walmart for April. 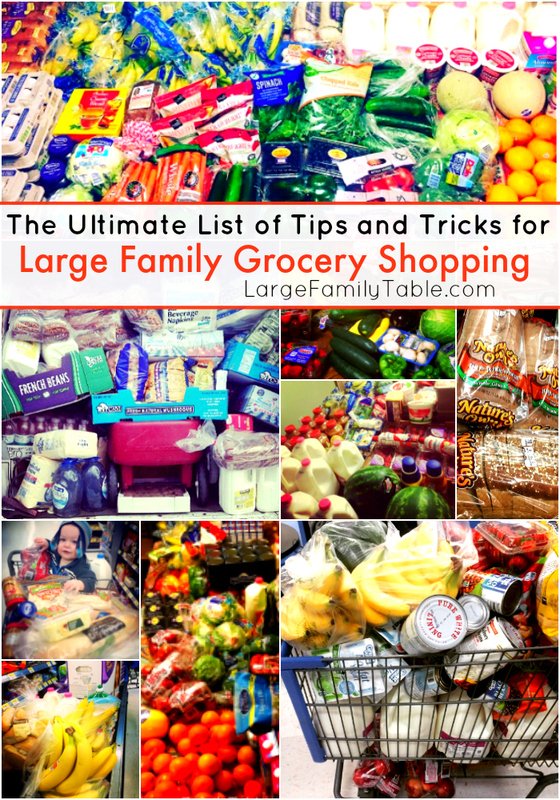 In this grocery haul, I shopped ahead for many of our large family meals including breakfasts, lunches, dinners, and snacks. I shared I had 20+ new healthy freezer meals for the Instant Pot and Slow Cooker that were also included in that $630 haul. I also have an updated Large Family Meal Planning System for 2019. I’ve come to do a hybrid of weekly meal planning coupled with once a month grocery shopping. In short, I still plan and shop for 4+ weeks in advance, but I drill down the menu each week based on the family needs and activities of that particular week. 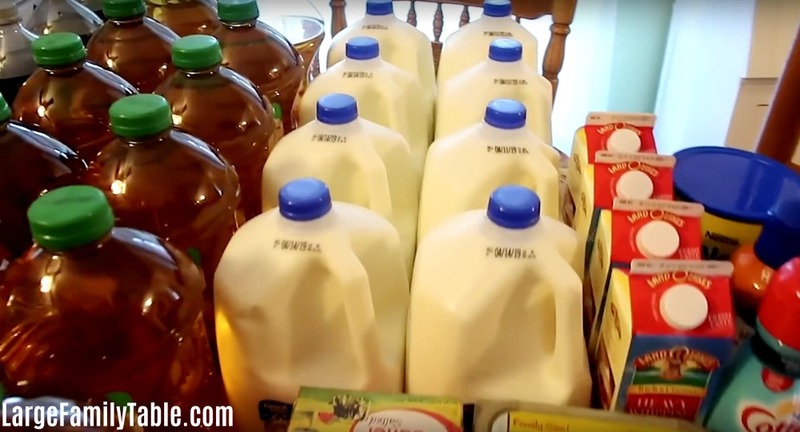 You can see how each week plays out in reality with my Large Family Meals of the Week videos. 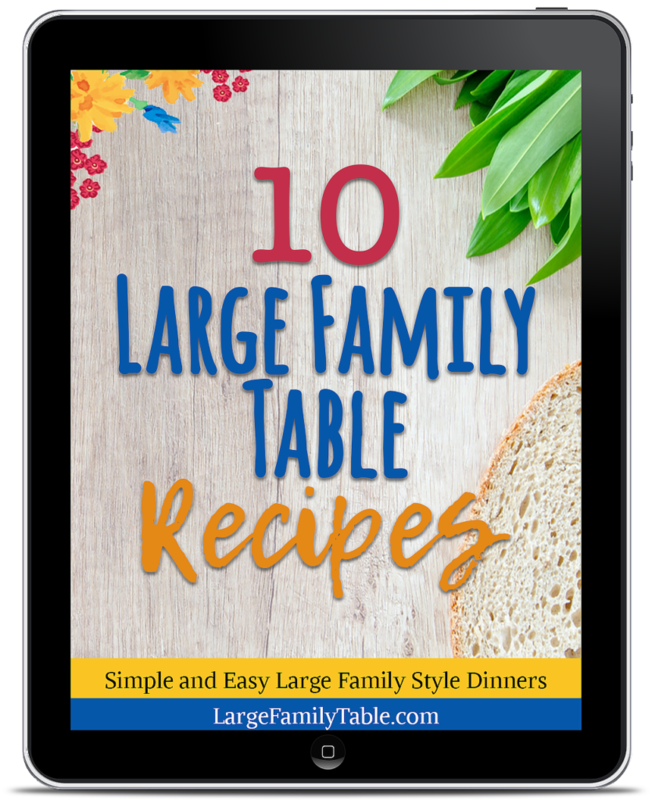 I get asked by moms to share my large family meal plans and large family dinner ideas on a daily basis. It is my hope in sharing my large family meal plan for April that those mommas get the inspiration, meal ideas, recipes, and encouragement to help them feed their growing families! 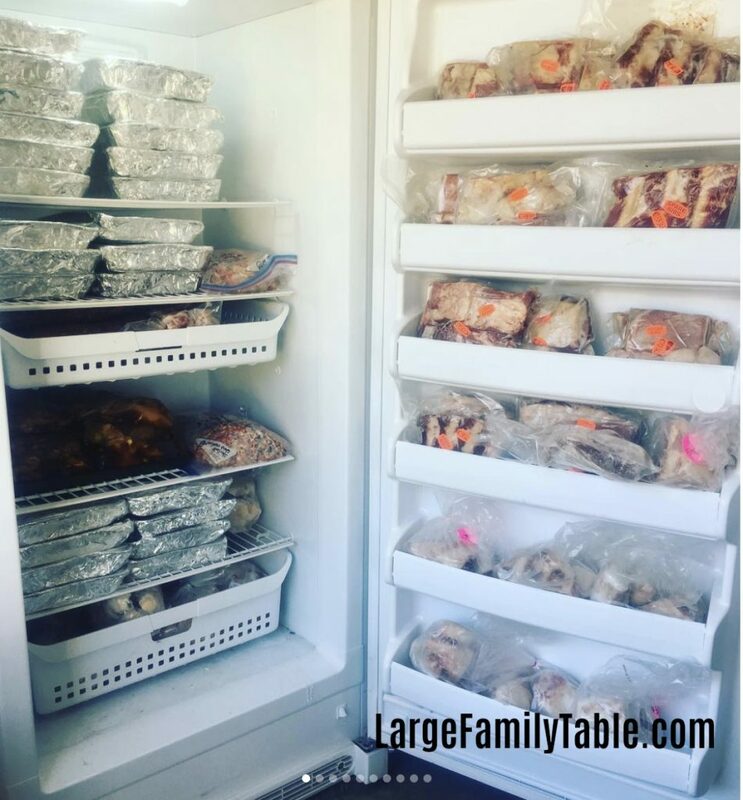 We have a nice build up of large family freezer meals in the freezer including what was left after I made 40 Freezer Meals for New Moms following my Large Family Freezer Meals Pack Two from my Large Family Freezer Meals Collection. After sharing freezer meals with friends that left us with about 18 dinners. I have multiples of several of these freezer meals so we may not use all of these make-ahead dinners in April exactly. Several of these freezer meals may wait for several months in the freezer to fulfill their destiny as I like to say. These are the freezer meals I currently have in the freezer and the recipes I’m working with for large family dinner ideas. Taco Bake Freezer Meal I serve this with crushed taco shells or chips on the top, sour cream, and a side of corn on the cob. Chicken Broccoli Alfredo Noodle Bake great as a one-dish meal! Tuna Cakes Freezer Meal this is a low carb meal that goes great with steamed broccoli. Ham & Cheese Potato Bake serve with pressure cooker steamed carrots. Beef Stroganoff Freezer Meal another stand-alone one-dish meal that always goes nicely with a little cup of applesauce. Baked Ziti Oven Bake serve with salad and butter bread. Chicken Tater Tot Casserole Serve with applesauce, carrot sticks or other favorite sides. Mild Italian Sausage and Peppers Bake – this is one of my new large family low carb freezer meal recipes that will be out in a few days. Check back for the updated links! 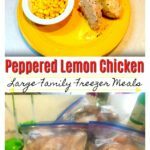 Peppered Lemon Chicken – another easy Instant Pot or Slow Cooker throw and go meal! Great with a steamed veggie and rice or quinoa. These two large family dinners aren’t already prepped ahead. However they’ll be quick and easy in the Instant Pot or 14 qt Pressure Cooker. Electric Pressure Cooker Baked Potatoes – I bought 20 lbs of potatoes in my recent Walmart grocery haul. We’ll have a baked potato bar night where the kids can top their potatoes with their favorite toppings such as butter, sour cream, bacon bits, and shredded cheese. Instant Pot Ribs – ALL THE RIBS! You might have seen a recent picture of my freezer on Instagram. I have a whole freezer door full of various beef ribs. These are part of what’s left from the full pasture-raised cow we bought the end of last summer. I plan to make several meals in both the Instant Pot and oven with these ribs. I’ll report back on how this goes! 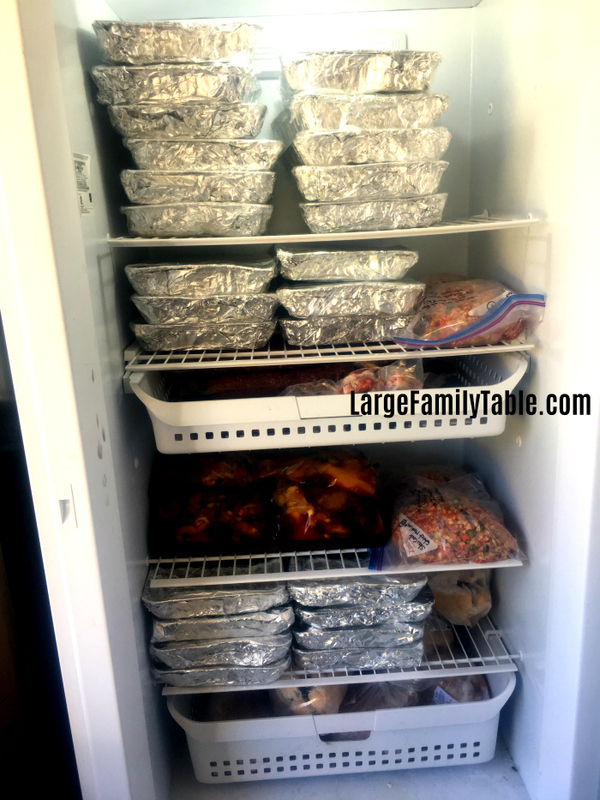 I’m listing these 20 large family dinner ideas and leaving 10 nights open for the month. This is because I’m sure we’ll have 2-3 times we eat dinner out during the month. This could be a planned stop at the cheap pizza buffet, a church pot luck, or dinner with friends (I know we have one of those this coming week). Then there will be nights we still have leftovers from the night before, I get a sudden recipe inspiration (it’s the disease of a recipe developer, ha!) or Travis gets grilling and I just make a salad as a side. Our first choice for lunches is always dinner leftovers from the night before. Many times I will pull out a sampling of leftovers, fresh fruit and veggie options, cottage cheese, cheese sticks, hard boiled eggs and the like so the kids can make a lunch plate of their choices. In addition to these lay-it-all-out-on-the-counter-lunches, we’ll also have Peanut Butter Strawberry sandwiches, Turkey and Cheese sandwiches, and Grilled Cheese sandwiches that we’re meal prepping ahead for the freezer. April is already a week in and we haven’t made ahead this 200+ freezer sandwiches yet, but I’m hopeful it’ll get done in the coming days. Make ahead freezer sandwiches are perfect to add in a bag of fruit and head for a hike or serve during schoolwork time. 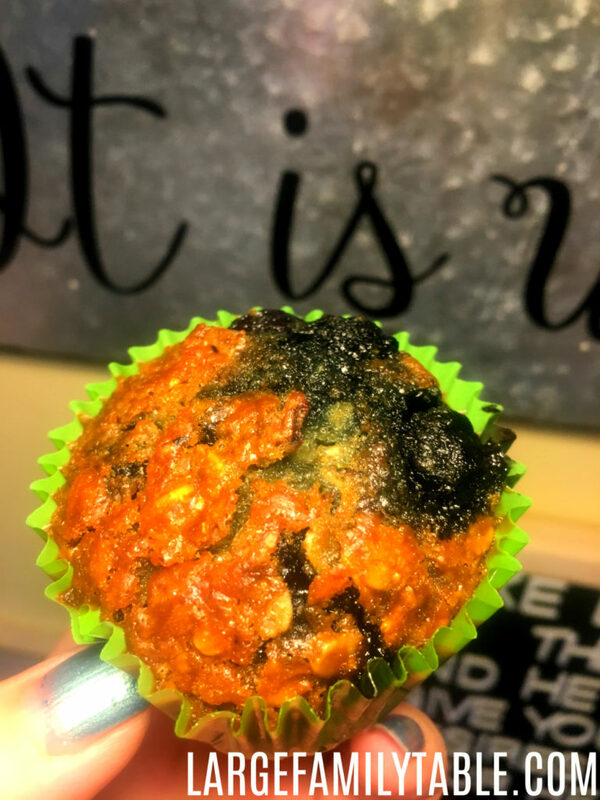 I don’t know about you, but this momma here needs lots of no brainer quick and easy meals at her finger tips! We did get one make-ahead breakfast meal in the freezer and that was for our Sausage “McStewart” sandwiches. Zion made 70 of those for us the other night. Besides that though we have no other make-ahead breakfast meals prepped. For the moment we’re eating lots of eggs by baking eggs in the oven most mornings. 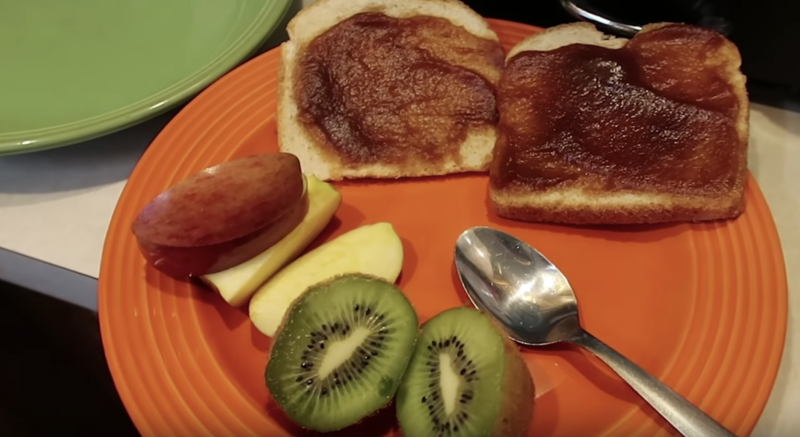 Some mornings we’ve served sausage links and toast or cottage cheese and apples along with the baked fried eggs. Even after our three-week pantry and freezer challenge we still have an abundance of oatmeal. I plan to rotate baked fried eggs, oatmeal with fruit (overnight slow cooker oatmeal is great for busy mornings), homemade yogurt with homemade granola, fruit smoothies with homemade granola bars, baked pancakes, and our prepped ahead sausage mcmuffins over the next few weeks. I was also able to get in an $80 discount grocery haul at Sharp Shopper which gave us a small boost of treat-type snacks I wouldn’t otherwise have in the house. We still have a decent selection of those cheap yogurts and snacks available. I plan to do some big batch snack prep as we roll through those Sharp Shopper treat snacks. I’ll make a variety of homemade protein bites, homemade yogurt, homemade granola, and homemade granola bars for upcoming “reality” snacks. Also for snacks, we keep a selection of fruits and veggies that are always available. If I had a dollar for everytime I said, “if you’re hungry eat a banana!” At different times I’ll batch cook several dozen eggs for protein-packed snacks as well. 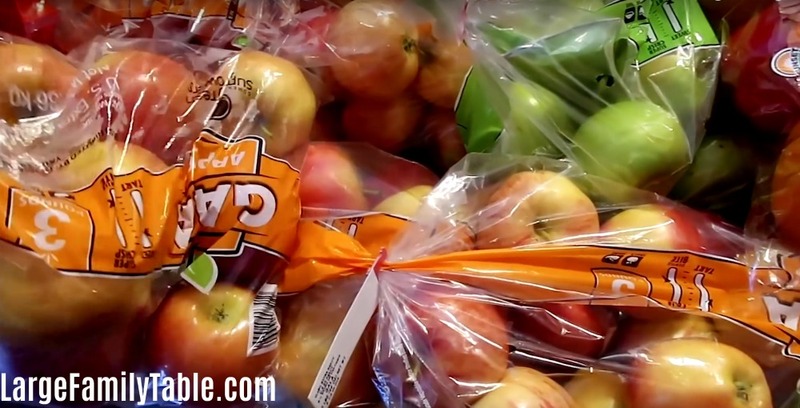 When I do my once a month grocery shopping fill-in haul in a few weeks Travis and I will try to take a few hours and do some batch snack and meal prep together. 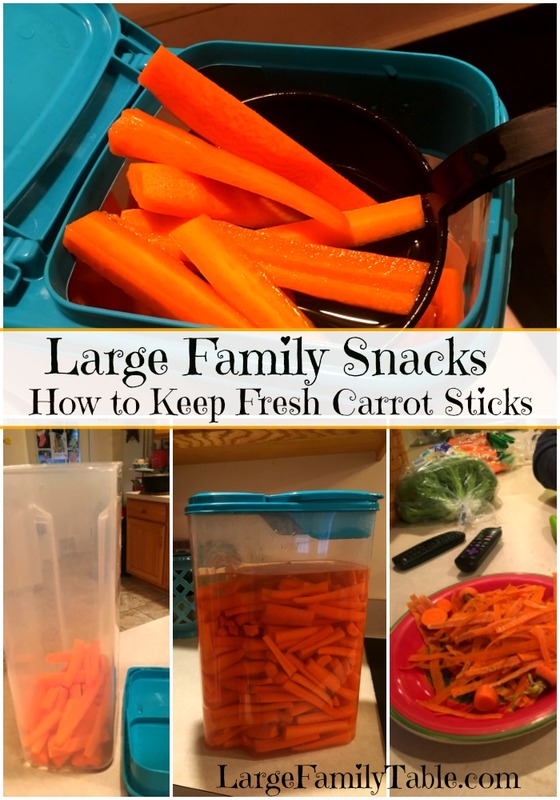 We’ll do a big batch of cheese sticks, celery sticks, carrot sticks (here’s how we keep carrot sticks fresh) and more based on what veggie deals I find at Aldi at that time. So these are my large family meal plans for the upcoming 4+ weeks for our family of ten. We work from home, school from home, and have a lot going on just like I’m sure you do in your family, too! I hope looking at my meal planning ideas for the coming month is helpful for you. 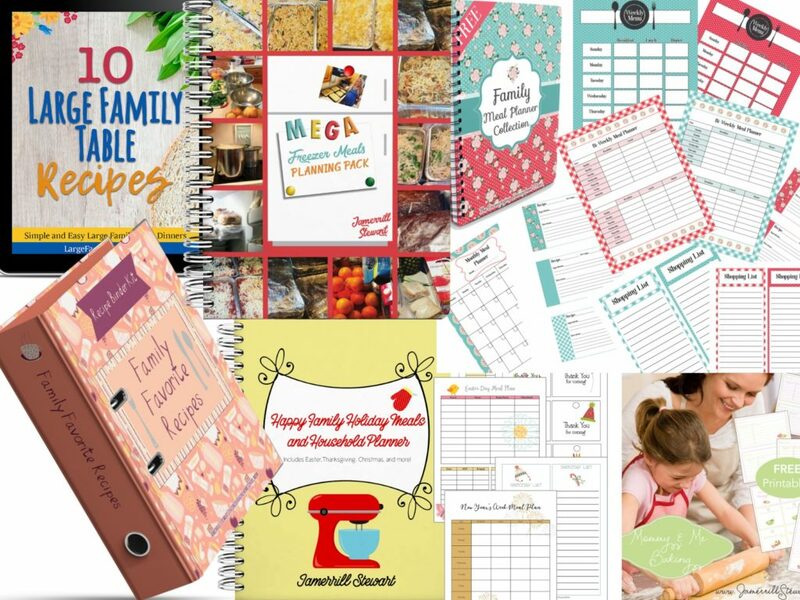 Large Family Meal Planning for the Month ideas! 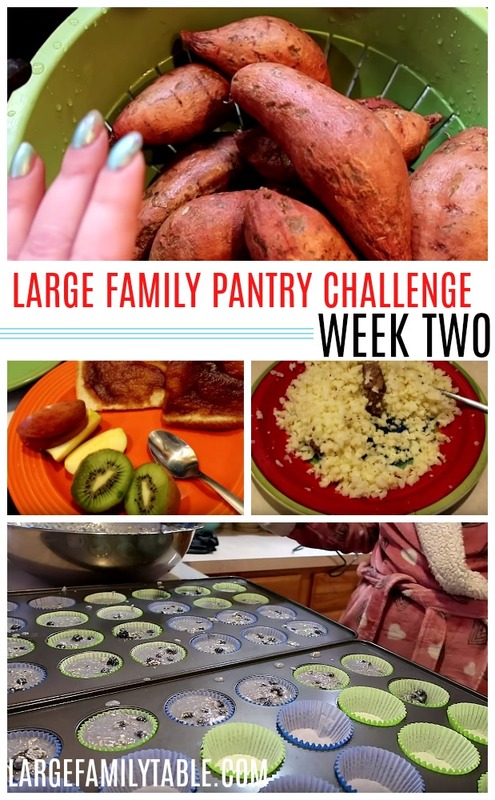 Pantry and Freezer Challenge ideas – I just finished up a 3 week challenge! 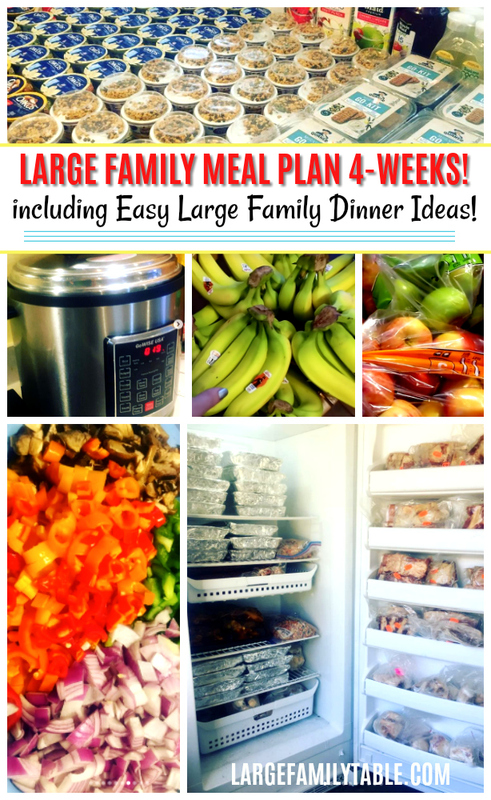 I’ll be sure to share how our large family meal plan plays out as the month progresses! Oh friend, if you are looking for freezer meals for new moms you have come to the mother-load resource for freezer cooking, let me tell ya! I love making large family freezer meals. I especially have come to depend on easy freezer meals during my postpartum time after a new baby. This was the case almost two years ago now when I did some Mega Freezer Cooking including 60+ Freezer Meals with 26 Dinners, 21 Breakfasts, 16 Lunches at the beginning of my 3rd trimester. Then made 100+ FREEZER MEALS FOR BIG FAMILIES towards the end of my 3rd trimester with baby #8. These two big freezer cooking times got my family through my last trimester and through the first 5 or so weeks after I had the baby. Once the baby was about 8 weeks old I did another “super mega” LARGE FAMILY FREEZER COOKING DAY time in September of that year. Pregnant or not I always work on keeping my stash of freezer meals stocked up in my freezer. I like to have a dedicated freezer cooking day at least once a month. Some months fly by and I’m not able to get in that dedicated freezer cooking day. Other months I’m able to get in 2 to 3 days which is very helpful! Recently it hit me that two of my homeschool momma friends were about to have babies and what better gift than freezer meals for new moms! I had just finished a three-week pantry and freezers challenge for my family so I had room in the freezer to make a bunch of freezer meals. I decided to take one evening and cook up one of my large family freezer meals packs to make freezer meals for these moms! Really, any of the large family freezer meals packs would have cooked up wonderfully to share. 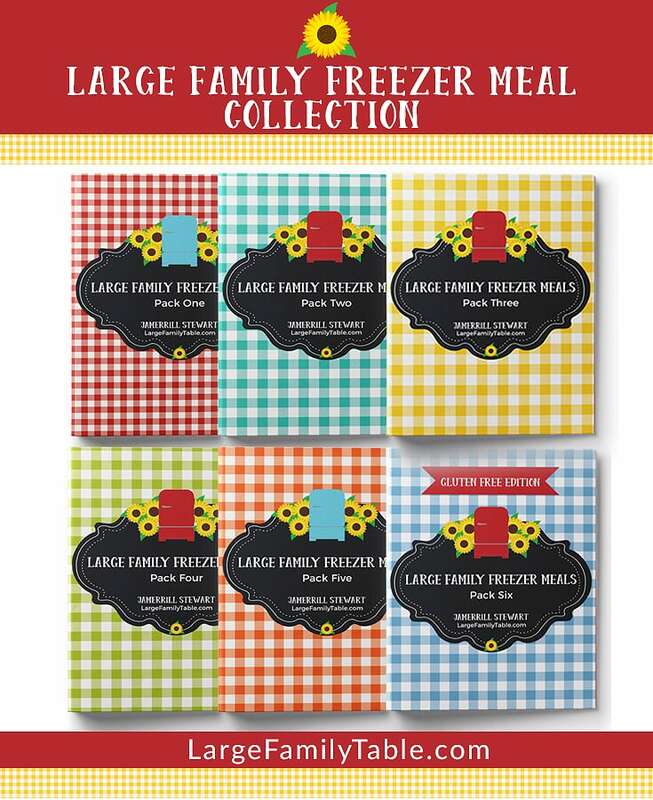 I went with large family freezer meals pack two which has a fun variety just like the other freezer meal packs. 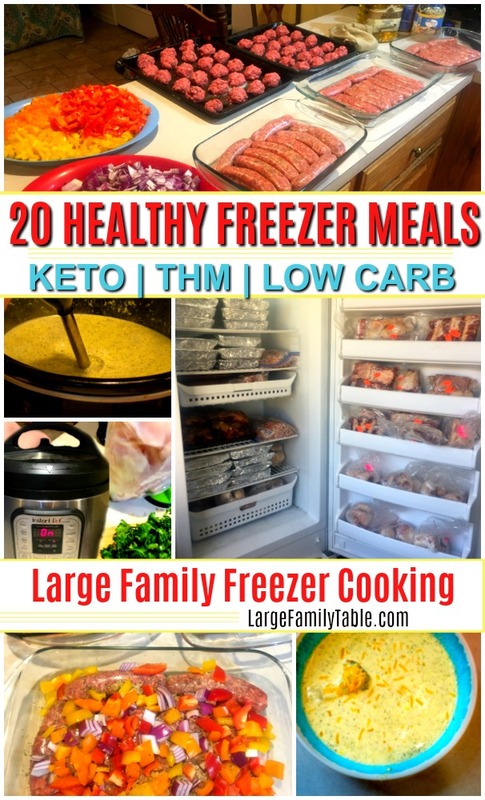 You can see the full Large Family Freezer Meals Collection here and use code Hello20 to take 20% off your first order! Here are all the freezer meal recipes I cooked up when making these freezer meals for new moms. Instead of looking up each recipe I used large family freezer meals pack two and followed the freezer meals grocery shopping list, big batch cooking guide which broke down all the steps efficiently, and additional freezer cooking directions to make making these 40 meals as much as a “breeze” as possible. Using the Freezer Meals Grocery List that comes with large family freezer meals pack two made putting in my grocery order quick and easy. I entered everything I needed from the freezer meals grocery list onto a Walmart grocery pick-up order. I spent $279 for everything I needed to make these 40 freezer meals. This makes each freezer meal a little over $6 per meal. 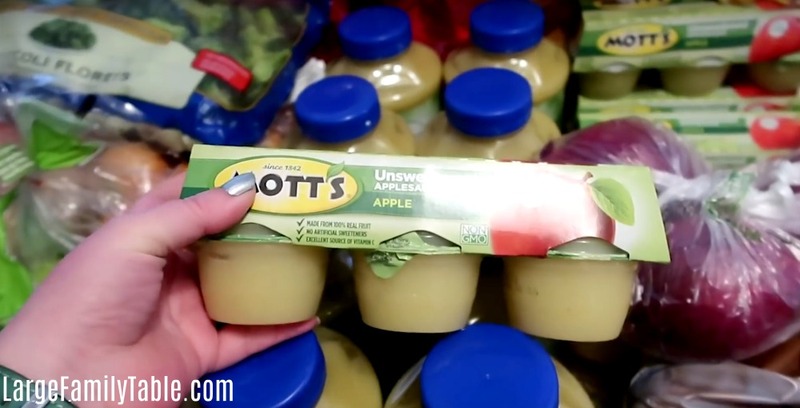 You can click here to watch my Grocery Haul for 40 Freezer Meals before Baby (for Friends)! 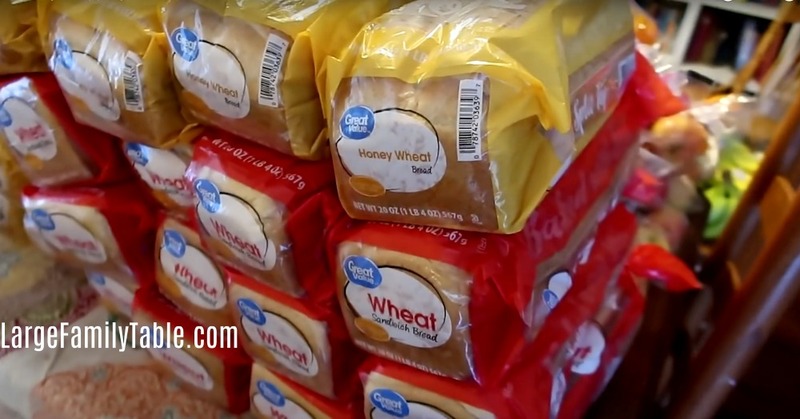 Cost of groceries will vary depending on the part of the country you’re in and what items you already have on hand. I already had several pounds of ground beef batch cooked and frozen in the freezer. You might already have chicken you stocked up on when it was on sale or other needed items in your pantry. 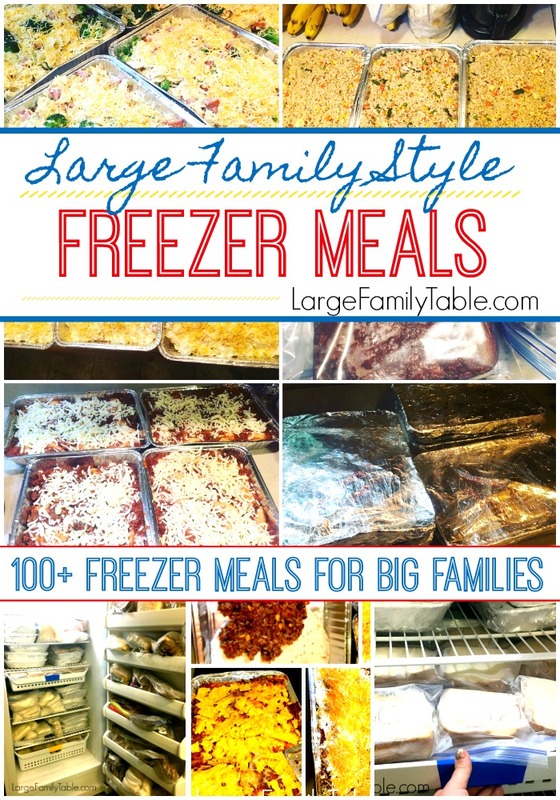 Depending on how you swing it, you should end up with about 35 to 40 large family freezer meals to fill your freezer fast by using one of the large family freezer meals packs! These are perfect freezer meals for new moms! And of course, not every mom has a nearly empty large family freezer ready to receive a bunch of easy freezer meals from their freezer cooking addicted friend as a gift, ha! I did talk to these mommas first to give them fair warning that freezer meals were coming. One of my friends took 12 freezer meals and the other momma took 5. I ended up having another person who needed some freezer meals blessings to take another 5 freezer meals. This left my family with a balance of 18 freezer meals. And believe me, those 18 freezer meals will get used up fast, quick, and in a hurry around here! 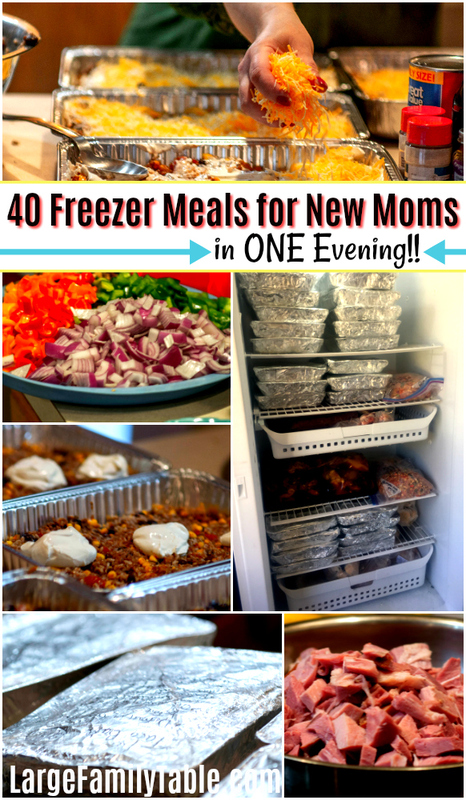 You can watch me cook up these 40 freezer meals for new moms here! And remember if you haven’t already get the free large family food collection, too! !